As businesses today continue to harness the power of globalization to expand performance, the role of effectively sourcing goods and services from suppliers has become inevitable. Additionally, procurement is transforming into a more strategic function that is aligned to organizational goals and objectives. Furthermore, issues like economic and political volatility, technological disruption, etc. have rendered market a fierce competition. Hence, it is important for organizations to adopt effective strategic sourcing skills and processes to maximize their business performance and efficiency to gain a competitive advantage over their peers. Strategic sourcing refers to the process of identifying the spend profile of an organization and its supplier base to ensure their business requirements are aligned with the suppliers. The boom in the adoption of strategic sourcing implies that almost everyone has heard of it. However, being a term that encompasses a large number of sub-concepts, understanding strategic sourcing might get complex. 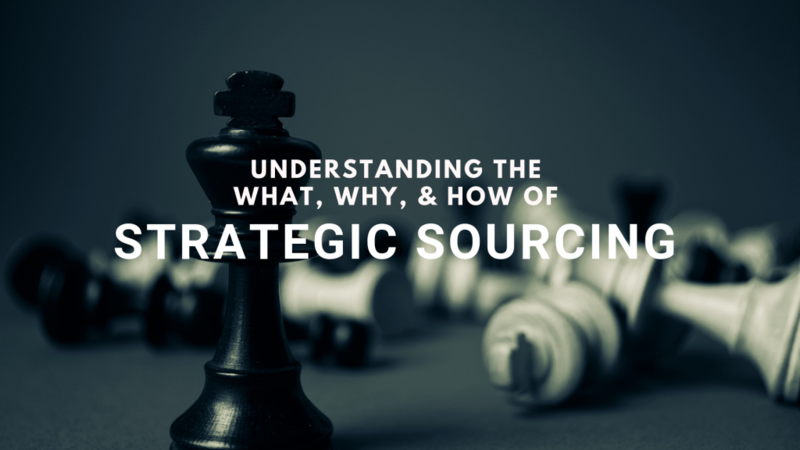 Hence, this article attempts to cover what constitutes strategic sourcing, how it differs from tactical sourcing, and its driving forces and processes. Strategic sourcing involves developing a proactive, holistic, and continuous evaluation and re-evaluation of the sourcing activities in an organization. Strategic sourcing aims to achieve the lowest Total Cost of Ownership (TCO) along with minimal supply chain risk. Hence, it reflects the organization’s relationship with its sourcing partners as a loop instead of a one-way process—an in-depth profile of the suppliers and their core capabilities is developed and periodically aligned to the sourcing requirements of the organization. Strategic sourcing views suppliers as crucial value partners and aims to building sustained, collaborative relations. The customer-supplier loop is assessed at every stage of its lifecycle in order to ensure that the needs of the organizations are continuously and efficiently met. To accomplish this, strategic sourcing leverages spend analysis, supplier evaluation, supplier relationship management, and detailed market research. Strategic sourcing is, hence, a long-term process and for its successful implementation, it needs skilled personnel and relevant technology platforms and tools. In contrast, tactical sourcing involves a short-term and traditionally reactive approach towards managing the sourcing activities of an organization. It aims to achieve the lowest possible cost without considering other factors like supplier relationship management, supply chain risk mitigation, etc. Consequently, the focus on building long-term relationships with suppliers and understanding how their core capabilities can meet the organization is minimal as communication with suppliers only occurs when problems arise. 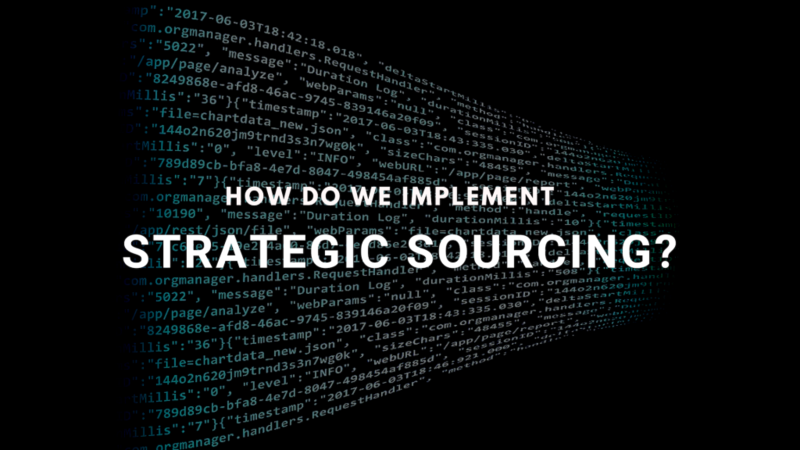 While tactical sourcing can bring gains in the short-term, it prohibits sustained optimization of its sourcing activities. Furthermore, compared to strategic sourcing, tactical sourcing doesn’t necessitate large investments in advanced technological platforms and personnel skillsets. Why do we Need Strategic Sourcing? The most obvious benefit businesses will experience from strategic sourcing would be higher levels of cost savings. By identifying and selecting suppliers that will provide the highest value at the right pricing will enable an organization to continuously achieve higher cost savings. 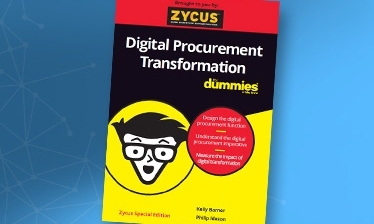 This is even more important as according to Zycus’ Pulse of Procurement 2018, 54% of top procurement professionals have recognized cost savings as a key focus area. Aligning the sourcing activities of a business to its organizational goals and objectives is at the crux of strategic sourcing. Better alignment allows the business to achieve higher business performance with higher efficiency and minimal supply chain risks. In order to effectively implement strategic sourcing in your organization, it is necessary to analyze the suppliers, their profiles, and core capabilities. Once this is accomplished, an organization is equipped with information that will allow them to match their business objectives to their ideal suppliers. This implies highest value-creation at lowest-possible cost. Strategic sourcing helps an organization build long-term relationships with its suppliers. By reinforcing the focus on the core capabilities of the suppliers and assuring the right suppliers for the right sourcing objective, strategic sourcing helps create a synergy between organizations and its suppliers. Sustained relationship with suppliers also implies that when the suppliers are valued and considered in various sourcing decisions; they feel motivated to optimize their performance to meet the organizations objectives. How do we Implement Strategic Sourcing? To initiate the strategic sourcing process, identify the spend areas existent across all the business areas in the organization and categorize it on the basis of how critical/non-critical the spend area is. Categorization will help prioritize the sourcing activities for each spend area. If required, other categorization criteria that better suit the business requirements can also be developed (e.g. : domestic/international spend, direct/indirect spend). In such cases, it is important to do a risk analysis of the chosen spend categories to help prioritize and develop strategies. The second step includes building a strategy on how each categorized spend area will be approached. This involves identifying the requirements of the business units that necessitate spending and defining goals, objectives, and corresponding timelines to fulfill the requirements. This also necessitates building a communication workflow so that all stakeholders relevant to the respective sourcing projects have clear visibility of upcoming updates. The third step is to execute an in-depth analysis of the current and future suppliers to understand and evaluate relevant supplier profiles. This includes analyzing the revenue or market share of suppliers to understand their market standing and industrial performance along with the risks and opportunities surrounding the supplier market. Once the supplier market research is completed, the fourth step is to request RFIs/RFPs/RFQs from suppliers. It is important to communicate the exact requirements of the organization as well as the end-goals and performance expectations so that the suppliers have clear understanding of what the organization needs. This is important so that they provide an accurate roadmap and develop strategies to fulfill the business’s objectives. The submitted information will provide insightful data—the pricing structure, delivery and warranty provisions, product/service specifications etc. After the submitted data is collated, the selection criteria can be identified for supplier selection. After the selection criteria are identified, the fifth step is to choose the suppliers that can offer the highest level of cost savings along with delivering quality. After supplier selection for the relevant spend areas, the contracting process starts to on-board the suppliers. The process of strategic sourcing doesn’t end at choosing a supplier. The sixth step is to effectively measure how suppliers perform vis-à-vis the requirements and objectives of the organization. It is important to engage in periodic tracking of supplier performance and identify areas for improvement. This can significantly help organizations understand supplier risks and design strategies to mitigate all possible supply chain disruptions. The seventh step is factoring Supplier Relationship Management (SRM) in the strategic sourcing process which makes the relationship between the organization and suppliers a loop instead of a one-way process. SRM enhances the level of collaboration between an organization and its suppliers by transforming a mere customer-buyer relationship into strategic value partners. Both parties participate in building propositions and innovative strategies that optimize the sourcing needs of the organization. The relationships that arise out of such synergized collaboration are long-term and can be leveraged to further improve supplier performance. More than just being the final step in the strategic sourcing process, SRM links suppliers and organizations in a way that both current and future requirements are met in the most efficient and value-maximizing manner. Automation is everywhere and procurement isn’t far behind. Organizations are adopting eSourcing in order to streamline their strategic sourcing activities and simplify the complexities that surround it. A CIPS blog on ‘E-sourcing can help your organisation collaborate on procurement’ by Alun Morris talks about how eSourcing not only focuses on finding the right suppliers for the right sourcing need, but also enables various business units in an organization to collaborate on their sourcing activities. This is necessary as every department will have their unique set of sourcing requirements. Organizations using eSourcing software enables ‘end-users to source their own suppliers within the bounds of necessary procurement and compliance rules.’ The end-users of an organization can easily use eSourcing tools to gather competitive pricing from available suppliers vis-à-vis e-tendering and select the right ones. eSourcing platforms generate useful data regarding spend activities of an organization, supplier performance, and supply chain risk evaluation. The data will improve visibility and also enable holistic assessments of the various on-going sourcing activities, thereby allowing the organization to make more informed sourcing decisions. Automaton of strategic sourcing activities helps identify and categorize the various spend categories that exist in an organization across business units. Improving visibility of spend categories enables an organization to streamline and control its spend activities. eSourcing enables an organization to identify, evaluate, and mitigate various risks that impede supply chain thereby improving compliance. This expedites business performance, reduces excessive spend due to supply chain failures, and helps organizations cope with various external and internal environmental disruptions. As an added bonus of automating strategic sourcing, Pulse of Procurement 2018 identified Supply Risk Management as one of the key procurement focus areas. An eSourcing platform showcases the workflow of sourcing activities and its corresponding stakeholders. It enhances the level of visibility, accountability, and compliance of all the relevant stakeholders involved in respective sourcing projects. 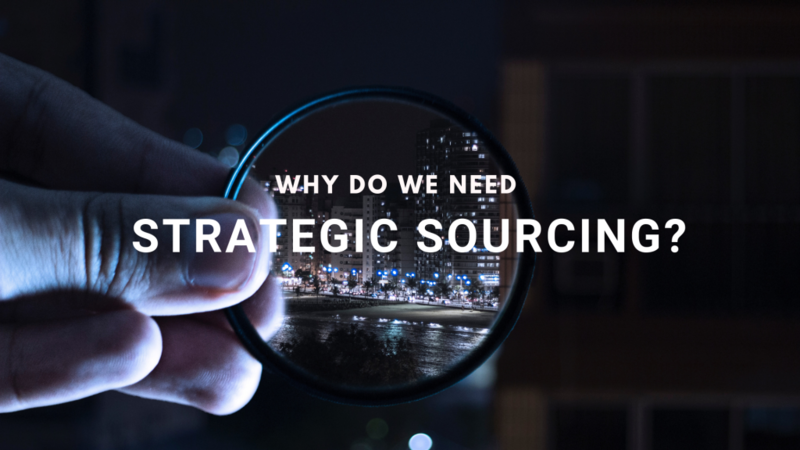 The attempt of this article is to demystify the various facets of strategic sourcing—what it stands for and how it differs from tactical sourcing, the advantages organizations experience through strategic sourcing; its process and factors that drive its automation. Organizations are adopting strategic sourcing to establish a holistic approach to manage their sourcing requirements and to build a more proactive approach to the various supply chain disruptions. By aligning the business goals and requirements to the right suppliers with the right capabilities, organizations maximize their performance and gain a competitive edge over their peers. Furthermore, by leveraging the power of automation technology for strategic sourcing, business units are empowered to optimize their sourcing. Strategic sourcing is here to stay—it delivers cost savings without compromising on quality. Are you there yet?